Pentecost: is the culmination of the whole paschal mystery. If Christmas is “God with us”; if Good Friday & Easter is “God for us” then Pentecost is “God in us”. The first Pentecost was the beginning of the Church but Pentecost is always happening; the grace of God is always on offer. However we must make ourselves open to receive His Gifts. Mother Mary, spouse of the Holy Spirit obtain for us this grace! June - Month of the Sacred Heart: The supposedly warm month of June reflects the burning heart of Our Blessed Lord who says in the Gospel “Come to me all of you who are heavy laden and I shall give you rest: shoulder my yoke and learn from me for I am gentle and humble of HEART”. This ancient devotion reminds us of the incarnation. St Teresa of Avila says when we find it difficult to pray we should just think of the humanity of Christ; then we just talk to him and spend time with him in a way that is natural. The gift of faith should be nourished by our piety on a daily basis as should any important relationship. FHC DVD orders - Last day today: Please hand in your order form today so we can let the videographer know numbers. There are spare forms if you have lost it. Welcome to Canon Anthony Charlton: and all our visitors who have come especially for this memorial Mass to Canon Charles Walker (1924-2017), the founder and first chaplain to the African & Caribbean Chaplaincy. Luisa Hogan RIP: Last Friday week (26th May) we received the sad news that Luisa had died in hospital. Her Requiem will be held here on Friday 16th June at 2pm. Welcome to God's Church: Anastasia Assunta Di Genua, daughter of Giovanni & Sylvia and Anne Elizabeth Fletcher, daughter of Michael and Geethanjali who were baptised by Fr Lukasz in May. Cleaners this week: Arinola Badejo, Temilade Lawal, and Ngozi Otukwu. 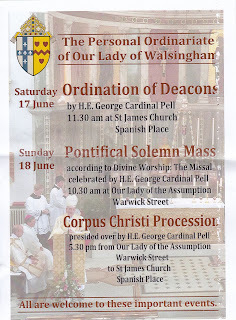 Ordination of Deacons: Saturday 17th June 11.30am at St James’, Spanish Place by H.E. George Cardinal Pell. 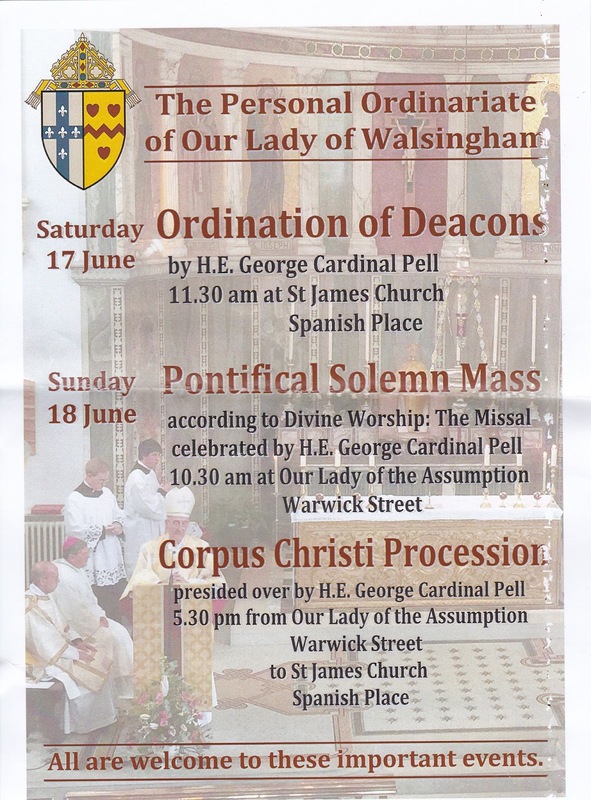 On Sunday 18th 10.30am at Our Lady of Assumption, Warwick Street, Cardinal Pell will celebrate a Pontifical Solemn Mass and then at 5.30pm there will be the Corpus Christi Procession from Our Lady of Assumption (Warwick Street) to St James’, Spanish Place. All are welcome. Annual Martyrs' Walks: Sunday 25th June 1.30pm. 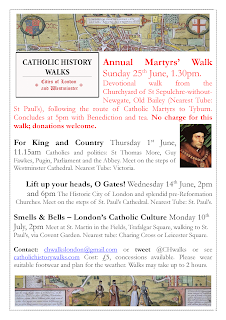 Devotional walk from the Churchyard of St Sepulchre-without-Newgate, Old Bailey, following the route of Catholic Martyrs to Tyburn. Concludes at 5pm with Benediction and tea. No charge for this walk, but donations are welcome. 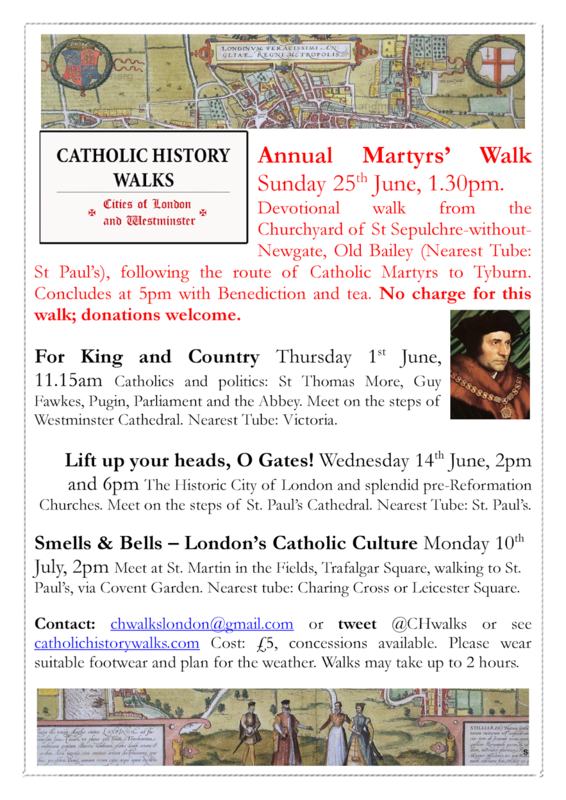 See poster for more Catholic History Walks. It is for children aged 8 to 13 and costs £145 per week. Should you require an application form or more information then please contact (between 6pm and 9pm) the boys camp on 07534 065347 or the girls camp on 07491 811167. More information can be found on the website http://svpboscocamp.org.uk or on the poster at the back of the church. Evangelium Conference 28th – 30th Jul: 18-35 year olds. Visit www.evangelium.co.uk 01834812643 or email evangeliumproject@gmail.com. Costs£120 or £95 for students & unwaged). Faith Summer Break 14–17th Aug. 11-15 yrs. Cost £160. Book online for both Summer Session & Summer Break www.faith.org.uk. Altar Servers Summer Break 15th – 18th Aug (to be confirmed) for those aged 10-15 years. For more details contact Fr Stephen Boyle at St Anslem’s, Dartford (sboyle@clara.net).